I was given a 6 month subscription to Glossy Box which finished in February and I was swithering whether or not to give it up as also subscribed to Birch Box. 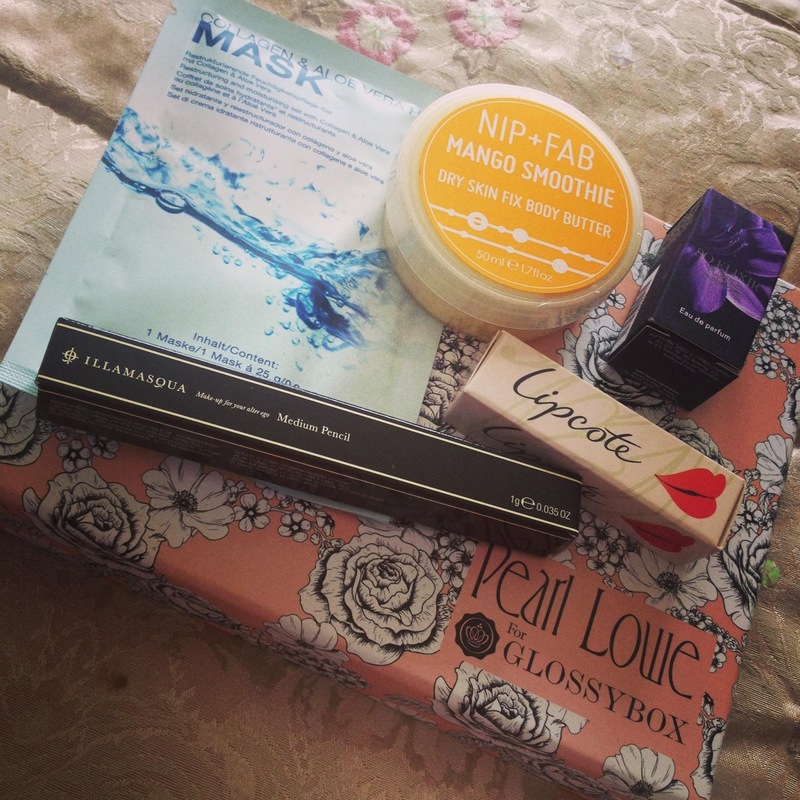 This month I decided to resubscribe as have found the Birch Boxes a little disappointing. There seems to be a divide between the boxes, you have the 'great boxes' and the 'naff boxes' and I always seem to be in the category that receives the latter. I am still giving Birch Box a chance to redeem themselves. The main thing I love about Glossy Box is the special edition boxes that come out every so often and Aprils box by Pearl Lowe is no exception. It is gorgeous peach box with a rose motif designed, this is right up my street - favourite colour - peach/coral and favourite flower white roses. I will definitely be recycling this for trinkets and accessories. I always seem to receive my Glossy Boxes towards the end of the month which can be a little annoying at times because I allow myself to read the spoilers. This smells beautiful, I love mango body butters, It seems very similar to the Body Shop version so very pleased. Perfume samples are usually a little disappointing to receive in the box however, this is a good size and it a pleasant scent. You can't go wrong receiving a little Illamasqua, I was a bit wary when I received the white pencil however, I used this last night underneath my eyebrow as a highlighter, and when blended in, was really nice. This is a regeneration treatment to improve the skins elasticity and provides hydration. I like trying new masks and enjoy a bit of pampering so looking forward to trying this out. The only disappointment was the Lipcote, this product really isn't my cup of tea, I think it tastes nasty when applied and has a odd tingling sensation which I don't like. I am pretty sure I received a Lipcote recently in a previous box - I could be wrong. I noticed some of you got Essie Nail varnish - i'm well jel! If you would like to leave your links below to what you got, i'd love to hear. I got exactly the same box as you! I am going to be doing a review soon as well as it was my first ever box and I haven't tried any of the products that I received before so that was a bonus for me. Love the products in this book, everything looks great!